If your kitchen is undergoing a renovation, or just needs a quick update, consider redecorating it with a country motif. This doesn’t have to mean a galvanized wash basin and antlers on the wall, however. Rather than saturating your kitchen with one theme, try adding in elements of it. Small changes can bring hints of the country inside but without going overboard. If the idea of doing too much at once is overwhelming, starting with small changes first can help. Some of the smallest details are what really drive the country idea home. 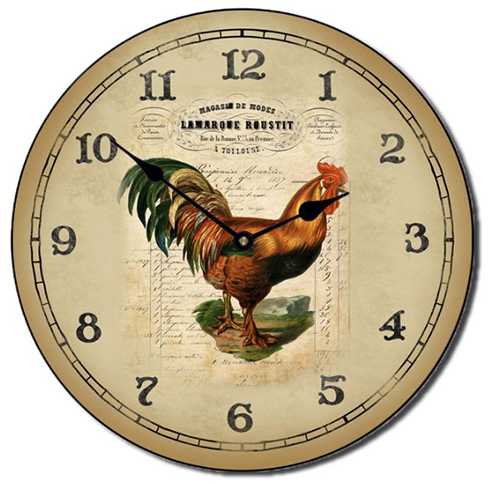 Replace the dusty old wall clock with a rooster kitchen clock. Opt for a wide apron-front sink to add a more rustic feel versus a more modern model. Put a woven rug on the floor. It doesn’t have to be a drastic change to make a huge difference when decorating. Pick color swatches in shades typically associated with the country vibe. Greens and yellows might be an example, or perhaps reds and browns. 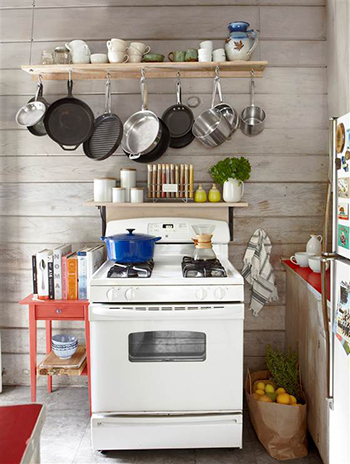 Whatever the color scheme, give it small “pops” throughout the kitchen before rushing to paint the walls anything bold. Using the chosen colors as a guide, buy coordinating small appliances and dish towels. These can be small, nondescript ways to add color to the kitchen without overdoing it. Reuse what’s already available and repurpose it to fit the new motif. Turn an unused water jug into a flower vase, or hang pots and pans on the wall instead of hiding them in a cupboard. Be creative with items already within the household and find a way to repurpose them. It’s important to be happy with a new kitchen, and going for a particular theme is a bold move. Bring the country motif into the kitchen in subtle ways rather than diving in feet-first. Sometimes in a remodel, less actually is more. Remodeling your kitchen can be one of the best investments you can make in your home. It can turn an ordinary space into a custom designed, functional work area, and when the time comes to sell, the updated kitchen will help you sell quicker and for more money. There are just a few key factors to consider before you begin this worthwhile project. The color scheme you choose should make you feel comfortable and blend well with the rest of the house. Begin by taking a good look at the colors throughout your home. If you tend to use neutral colors, stick with these hues in the kitchen too. The same applies for bright, bold colors. Make sure the appliances blend in nicely. White refrigerators, stoves, and sinks work well in country settings while stainless steel ads an elegant, upscale feel to contemporary kitchens. If your remodel is simple, you may be able to make this a do-it-yourself project. Painting, adding new furniture, or switching out the appliances is all easy tasks that you probably won’t have any trouble doing on your own. If you are replacing the cabinets, adding windows, or putting in new floors, you may want to hire someone to do the work. Contractors for home remodeling can accomplish these jobs much more easily than you can. Ask your friends for recommendations or search on sites such as renovationexperts.com for qualified professionals in your area. The kitchen is the heart of the home where friends and family gather together. If space allows, you will want to add seating so that everyone is comfortable. Think about how this room is used. Not only do families eat their breakfast, lunch, and dinner in this area, but you may need a space for the kids to do homework. A small scale table and chairs can create the perfect eat in kitchen, while islands can be designed to include bar stools along one side so that you can easily visit with others while cooking. If you keep these three factors in mind as you design your new kitchen, you will end up with a comfortable and functional space that you will enjoy for years to come. It is an investment you will immediately see a return on as you gather together in this room with your loved ones. Kitchen is where we spend a great deal of time preparing the best meal we can serve our family, so it’s fitting to have an organized and spacious corner to inspire us to cook more. I would love to have a neat interior design but I don’t have the talent and resources to do it. 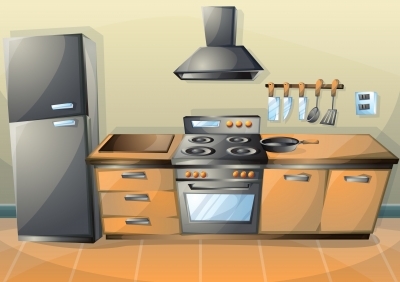 If you’re working on a minimal budget, you can still make your kitchen in tip-top shape. You can start taking out some unnecessary fixtures and leave only the things that you need or use every day. Hang some or your favorite pictures or painting that you’ve been meaning to hang on your kitchen wall for a long time. If you don’t have a budget for repainting, you can get one of your old curtains. There are a lot of curtains to choose from if you intend to buy one, but choose the ones that will create a warm environment for your kitchen. Just remember not to go beyond your budget.